Andrea Santarlasci. A legend o.. These days, when the term “Selfie” is on everyone’s lips, the exhibition “Dancing with Myself” brings back down-to-earth a generation that often does not know the origins of the concept of Self-portrait. 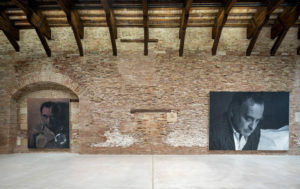 Among the visible bricks at Punta della Dogana a long story is told and curated by Martin Bethenod and Florian Ebner, with 100 works from the Pinault Collection (many of which are unpublished for Venice) related to a selection of works coming from the Folkwang Museum in Essen (Germany), for a total of 145 artworks. 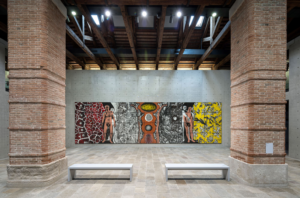 The exhibition explores the stories of vulnerable, sensuous and innovative characters, where the concept of “Myself” is not seen mainly as a form of narcissism but as a relation between one’s body and the outside world, being a political body. 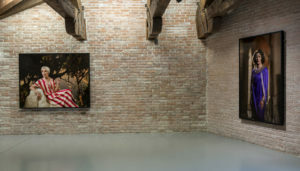 The show is focused on four themes, Melancholia, Identity Games, Political Autobiographies and Row Material and flips through significant names: from Claude Cahun to LaToya Ruby Frazier, from Gilbert & George to Cindy Sherman, from Alighiero Boetti to Maurizio Cattelan, from Rudolf Stingel to Lili Reynaud-Dewar, from Adel Abdessemed to Nan Goldin and lots more. “Dancing with Myself” faces different forms of “Self-portrait” from the 1970s to today and the artist’s role as “actor” into his own figure; the artist presents himself as a model to cross and overcome any censorship, showing his own alter ego on a fictitious stage. This is a collective exhibition where eclecticism emerges and paintings, photos, installations and sculptures dialogue one another. However, the technique that changed drastically the way of self-portraying is definitely photography: the artist, thanks to the self-timer and by standing in front of the lens and not behind, has the opportunity to penetrate into social media manipulating the communication codes from the inside; personality produces an identity alternation made of several realities. The photographic medium for many artists is the virtual space where the mixture of genres and the unmasking of stereotypes can eventually take place; photography built between truth and manipulation, between original and copy, becomes the main setting where bring out opposites and relate them at the same time. It is hard to tell all the feelings and stories that hide behind each work and each “self-portrait”, in fact, it is just the story as a whole that expresses the essence of the project. 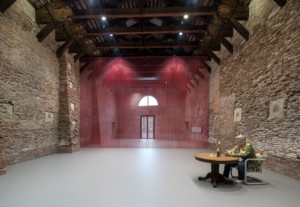 – The dialogue between his own body and illness in the work by Felix Gonzalez-Torres, “Untitled – (Blood) 1992, where a large curtain that represents his blood (with red and white corpuscles), falls down at the entrance of the exhibition; the artists indeed was an AIDS sufferer and he died shortly after in 1996. This big curtain is a sort of ritual, an expression of tragedy and tenderness at the same time. 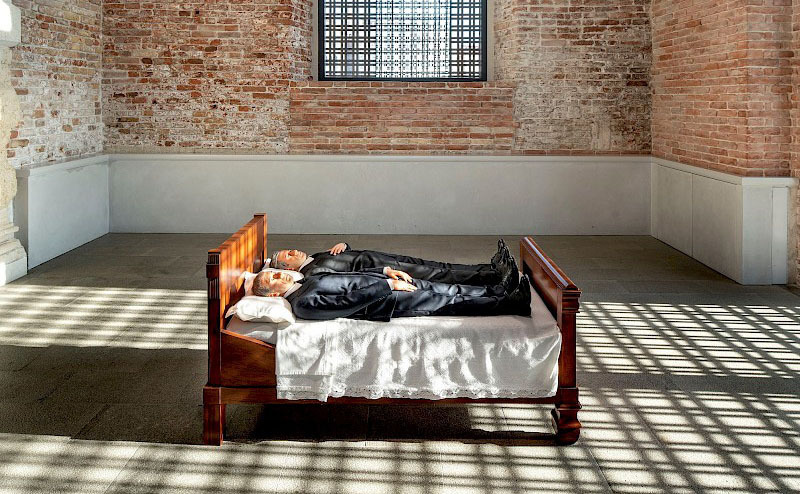 – The dialogue with his spectre, in the work “We” made in 2010 by Maurizio Cattelan, where fear and familiarity are the protagonists, and it is right over this work that I linger. 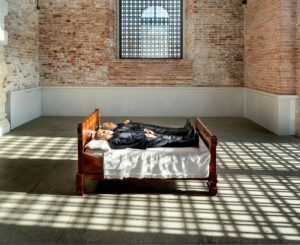 The artist portrays his own image lying on the bed, made of synthetic material and smaller than the normal human height; he creates a double self-portrait: one with his arms on his legs and the other one with his hand on the sheet and the other on his chest. 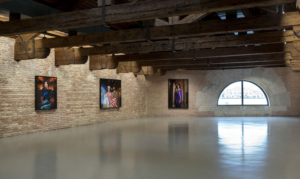 Although the posture reminds that of corpses, bodies seem to move or be dynamic, this is what we feel when we notice the two Cattelan’eyes peering at something or someone. This sculpture clearly symbolizes the will and desire for control also after death. In front of us there is a split Cattelan, where the same person lives two choices and consequently two different lives. I appreciate and love deeply this exhibition in all its wholeness. Curators wanted to highlight and move away at the same time from the standard concept of “selfie”, accusing partially the “artist” of today who does not know the origins of self-portrait and who dares daily to express himself through “media” and advanced technology. To “see ourselves” now becomes “to see ourselves through the others’ eyes” rather than through our eyes. In the past, the artist who portrayed his figure looked for the need for his body and then for a therapy, now “to portray oneself” is a purely narcissist experience and demonstrative by searching for others’ acceptance. Everything has changed and we realize it especially when we think at those artists that already in the 1930s hazarded their life and freedom, rather than restrain themselves (like Claude Cahun), and today it is odd to think that if you expose yourself you will hang behind. Don’t talk about “Selfie”, let’s talk about “Dancing with Myself”, don’t talk about those who want continuous approvals, let’s talk about those who declare constantly their own “self” without necessarily receive the others’ opinion. She graduated at the Academy of Fine Arts in Catania. During her lifetime, she has experienced various arts including sculpture, theatre, dance and photography, and the latter one became the springboard for her eclectic and innovative artistic path. In 2010, she approached the art curatorial world and started to write reviews and critical texts; later, she founded “Artisti Italiani – arti visive e promozione”, an organisation which deals with all the promotional aspects of contemporary art.